Laserfiche, a leading provider of enterprise content management (ECM) solutions, has launched the Laserfiche Digital Transformation Model, a framework for organisations to develop efficient digital workplaces. The model highlights five strategic phases of digital transformation, outlining the challenges, actionable steps and benefits for completing each phase and future-proofing an organisation. Digitising your documents is the first phase of the Digital Transformation Model. 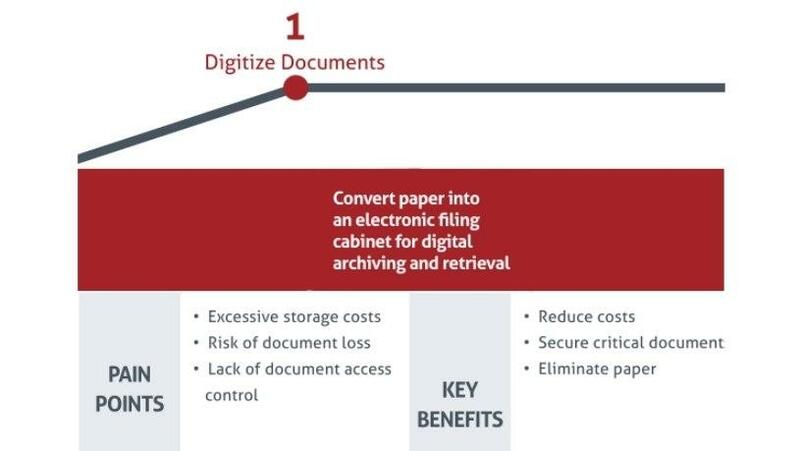 Your business is in phase one of the Digital Transformation Model if you are still generating a lot of paper, spending excessive amounts of money on storing this paper, you are unable to ensure the security of your documents, and documents are often lost during critical steps in your business process. * You are still at risk of data loss due to damage of physical documents in the event of fire, flood or decay over time. The first initiative in digitising your business processes is scanning all your paper documents into electronic documents, enabling them to be uploaded, viewed and even exported. This will dramatically improve the speed of access, security and reliability of your records. Digital files will serve as a backup for files lost in natural disasters or in any other way. The aim is that these files will then be collated from disparate hard drives or personal cloud solutions into one main repository that is centrally managed. Laserfiche has developed several capture tools to enable content capture with minimal effort. Images can be captured from mobile devices, giving you the ability to add documents and receipts to an electronic expense capture form directly from your mobile device. Now you don't need to file the paper documents anymore, and at the same time, you can speed up the expense capture process. Laserfiche Forms are easy-to-design Web forms that can be embedded on intranets or public Web sites. It has the ability to turn multiple paper forms into one dynamic electronic form that streamlines your business processes while eliminating paper at the same time. Noscotek assisted Mersen with digitising its paper documents. According to Roy Kotze, Noscotek Support Manager, Mersen's challenge was that it had to print its invoices and statements (that resulted in excessive storage costs) using dot matrix printers. These documents then had to be folded and placed into envelopes, posted and delivered to customers, before they could review for payment. This made account queries very challenging, as it was very time-consuming and the risk of document loss through the postal service was high, meaning customers never receive their invoices. Mersen needed to regain control over its documents and how they are distributed to customers. Using Laserfiche, Noscotek provided the company with a solution to enable its system to grab the text streams from the AS400 and create a digital PDF for the invoice and/or statement to be e-mailed to the customer. At the same time, an electronic record of the statement/invoice is also stored into Laserfiche, where it is indexed for quick and easy access during account queries. The result is that Mersen is now able to handle customer account queries instantly over the phone, being able to resend invoices to customers without having to reprint them, thus saving time and money. Thanks to Laserfiche, Mersen is on top of its game when it comes to customer service. To find out how Laserfiche can help you and in which phase of the DTM your business is in, please click here for a free assessment. Laserfiche is a leading global provider of enterprise content management software, empowering organisations to take control of information and business processes. With intuitive on-premises and cloud solutions for document management and process automation, Laserfiche improves productivity, efficiency and strategic decision-making for organisations looking to transform into a digital workplace. For more than three decades, Laserfiche has fostered an active user community that shares ideas and inspires solutions. To learn more, visit laserfiche.com/about-laserfiche.